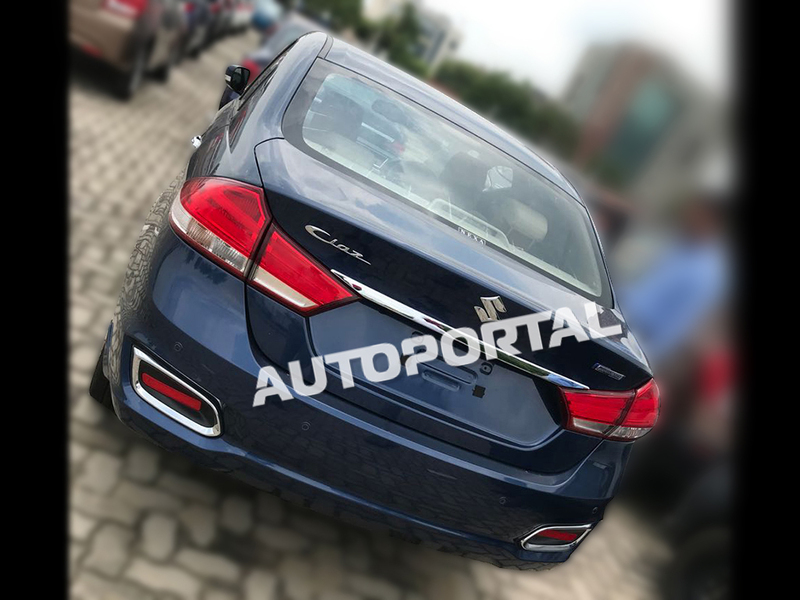 Upcoming 2018 Ciaz’s variant, colour, engine and transmission details have been leaked on the web. These were shared in a story posted by Rushlane recently. With this, we now have a confirmation that the petrol car indeed will be offered with the K15B engine. It will come mated to a manual as well as an automatic gearbox. The diesel will still be the same old DDiS 200 mill as offered on the current model. There is no automatic option on the diesel Ciaz. The updated car will come in 4 trim levels namely Sigma, Delta, Zeta and Alpha. 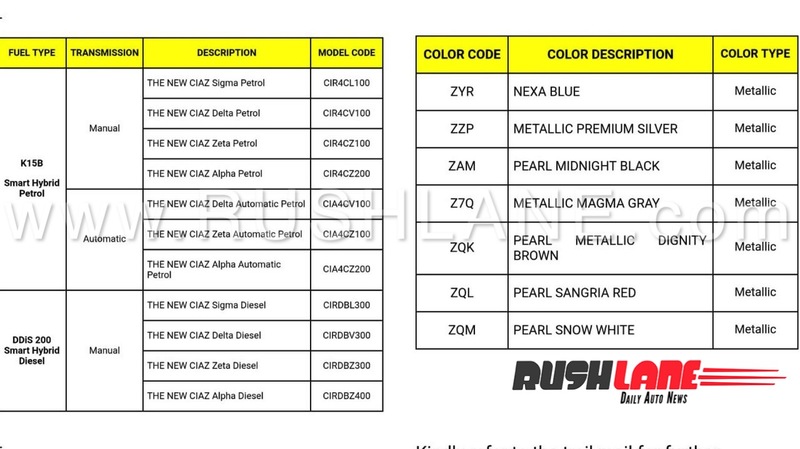 It will be offered in 7 colours which are Nexa Blue, Metallic Premium Silver, Pearl Midnight Black, Metallic Magma Gray, Pearl Metallic Dignity Brown, Pearl Sangria Red and Pearl Snow White. We had recently shared that Maruti Suzuki Ciaz facelift might launch on 20th August. The car is also available officially for booking since 10th August. It can be booked with Rs. 11,000/- either at the Nexa showrooms or at Nexa website. Recently, Car&Bike reported that the new Ciaz will be getting a 5 speed AMT with the 1.5L K15B petrol engine in addition to the MT. We need to see if this will be the one offered on the automatic variant or something else. The petrol engine is expected to produce 104HP and 130Nm torque. With the new information, we also have a confirmation of Maruti offering petrol Ciaz with a smart Hybrid. Speculations are, this will be a completely new unit. It will get two lithium-ion battery packs instead of one of the older system. This will help increase the efficiency of the petrol car quite a bit. With all these developments, Maruti has definitely upped the ante against the competition. It is clear from these spy pics that the nose of the car has been completely redone. 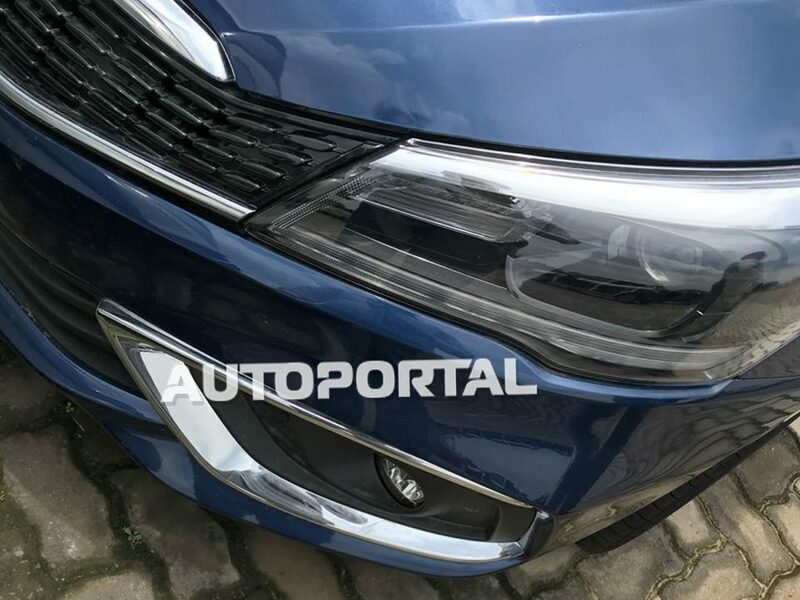 It looks very sleek & sharp now and, kind of, resembles the front of the new Indonesian Ertiga. The headlight units have LED DRLs included in them. These units will be LED this time. Also, the tail lights will be LED as well. The fog lamp housings are new too and feature chrome inserts. Apart from this, the design of alloys also appears to be slightly changed. The side of the car remains largely the same as the current one. The rear also remains very much the same with a slightly redesigned bumper and reflectors. The reflectors also get chrome surrounds, somewhat similar to the Chinese Alivio. The interior spy pics highlight the changes done inside the car. We already know from earlier about the new instrument cluster with a much larger MID. The twin-pod unit is clearly visible in the pics now, it gets chrome rings around the meters. Also, the needles look to be of different design with the centre pivots having chrome rings around them. The large MID, though not clearly visible, will be nearly double the size of the existing one and is expected to be somewhat like the one offered on top variants of Baleno. Hope the new Ciaz ends up getting the same interesting graphics in the MID as the Baleno. We can see that Maruti is continuing with the black and beige colour theme on the interiors. The other new addition is the light coloured wood trim separating the top black half of the dashboard from the beige bottom part. 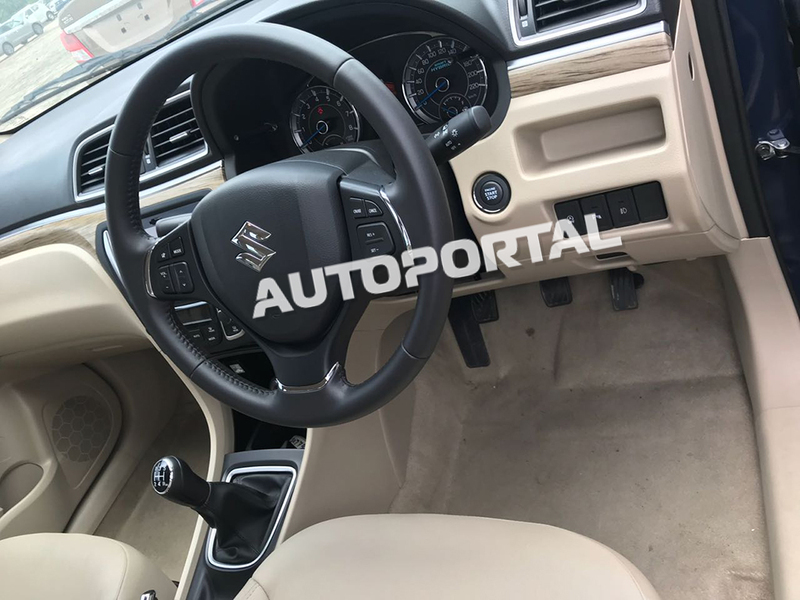 We can also see the car will now get beige leather seats and leather-wrapped steering wheel with chrome inserts, giving the cabin fresher, more premium look. These will be offered on the top end variants. Addition of a sunroof and more airbags would be a welcome move to make the car more competitive but, we do not have a concrete info about them. Other than this, the car will continue to have other features like a touchscreen infotainment system, auto climate control, push-button start etc., similar to the current car. There is an addition of cruise control to the feature list which is confirmed by the presence of setting buttons on the steering wheel. In addition to the K15B petrol engine, the current 1.3 DDiS will be carried forward on the facelift. There is also speculation that this engine will be replaced by a 1.5L diesel engine being developed in-house, at a later stage. The new Ciaz will be offered with an MT on both diesel & petrol variants. The petrol will also get an autobox of some kind. Spy pics highlight the presence of a 5 speed MT, we can expect this on both petrol and diesel. There were speculations about a 6 speed MT some time back but, there are no words now. With the car getting an autobox on petrol, Maruti will be well placed to cater to the need of the hour. 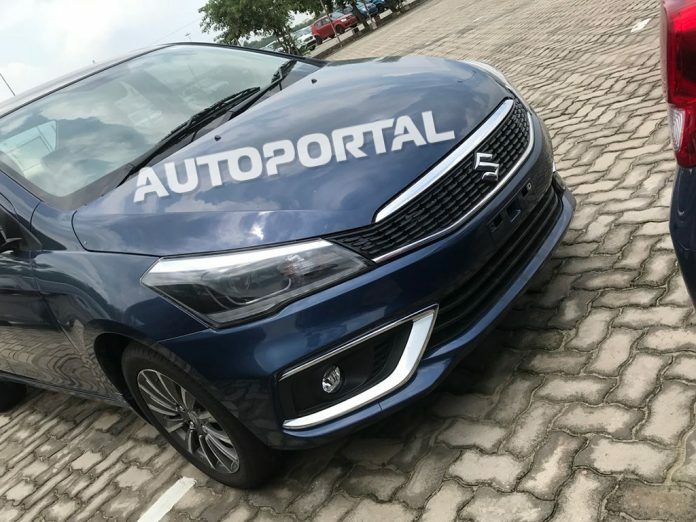 With the new Vitara Brezza AGS launched recently and new Ertiga also expected this year, Maruti looks to be taking the game up a notch for its competitors in terms of up to date product line up. It very well fits into their plan of hitting 2 million sales figure annually by 2020.